Lyn Johnson, Director of Maintenance for Gaughan Flying for the last 29 years, has done business with the Duncan Aviation Las Vegas Satellite Shop since it opened in 1995.Additionally, Lyn has been friends with Duncan Aviation’s Engine Tech Rep Bill Walker from Battle Creek, Michigan, for nearly 15 years. Lyn and Bill have been friends for years. Before coming to work at Duncan Aviation in 2004, Bill was an engine mechanic for a company near his home in Granite City, Illinois, where Lyn took his Challenger for maintenance. After moving to Duncan Aviation as an Engine Tech Rep, Lyn and Bill have maintained contact and their professional friendship. 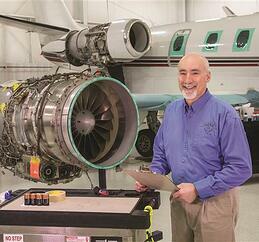 Lyn considers Bill a CF34 guru, and Bill continues to do the engine work for the Challenger 850 SE. In early 2017, Bill and two Engine Techs, Team Leader Jeff Lowery and Tech Dave Cordova from the Scottsdale, Arizona, Rapid Response Team performed a borescope on the Challenger’s CF34s, also in its own hangar in Las Vegas. Bill is always happy to get together with Lyn to talk and work on the Challenger’s engines. "Everything works as advertised,just like everything Duncan Aviation does." -Lyn Johnson, DOM, Gaughan Flying. Read more about this project in the Spring 2017 Duncan Debrief Magazine.